My problem started when I wanted to access one of the files on my server while I was using my OSX machine. I was about to reach for my trusty USB drive, and then it hit me, why couldn’t I just access the file on the network? I’m sure somebody has done it before, and it would make my life easier since I didn’t have to plug the USB drive and try to determine which side of the USB was the right side up. In all my years as a software engineer, never has a problem stumped me so much. I’ve wasted so much time googling, trying to find what “name” meant in this scenario. Was it my Windows username? Was my password my Windows password? What if I never set a password? I didn’t (or couldn’t) find anything on the internet that told me what “name” and “password” was on this screen. I tried every permutation of my Windows username (Nikko, NX-Server\Nikko, Nikko Bautista, and many more) and nothing worked. And then it hit me – when I was installing Windows 8 – I remember creating a Windows Live account, as Windows has also started getting linked up to an online Microsoft account, much like Apple’s OSX/iOS and Google’s Chrome OS/Android. 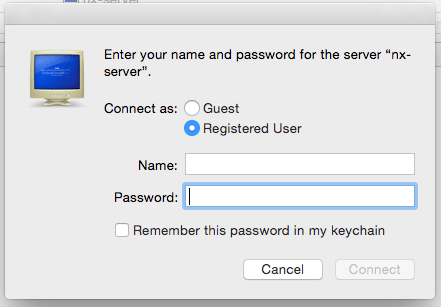 So I fired up 1Password (awesome tool, if you’re looking for a password manager that can work on virtually any device) and dug up my Windows Live login. I typed it in, and boom, it worked! I spent so much time trying to figure out how to connect to my file server that I forgot what file I needed in the first place. Oh well, at least I got this working, which was the important thing. So remember, next time you want to mount your a shared Windows drive on OSX, use the Windows Live/Microsoft account details (if you made a Microsoft account when you setup the OS)! I hope anybody else who has this problem finds this post before spending so much time trying to figure it out. Posted on April 14, 2015 October 8, 2015 by nikkobautista	This entry was posted in OS and tagged osx, smb, windows. Bookmark the permalink.